As part of the BFI’s ‘Gothic’ season, veteran film director and producer Roger Corman visited London in October 2013 to introduce a screening of his film The Pit and the Pendulum (1961). Alex Fitch interviewed the filmmaker about his career from the 1950s to the present day, and continuing on from the first part of the interview, which looked at his work on Edgar Allan Poe adaptations and remixing Russian sci-fi films, here they discuss Corman’s work as a producer and pioneer of new technology. 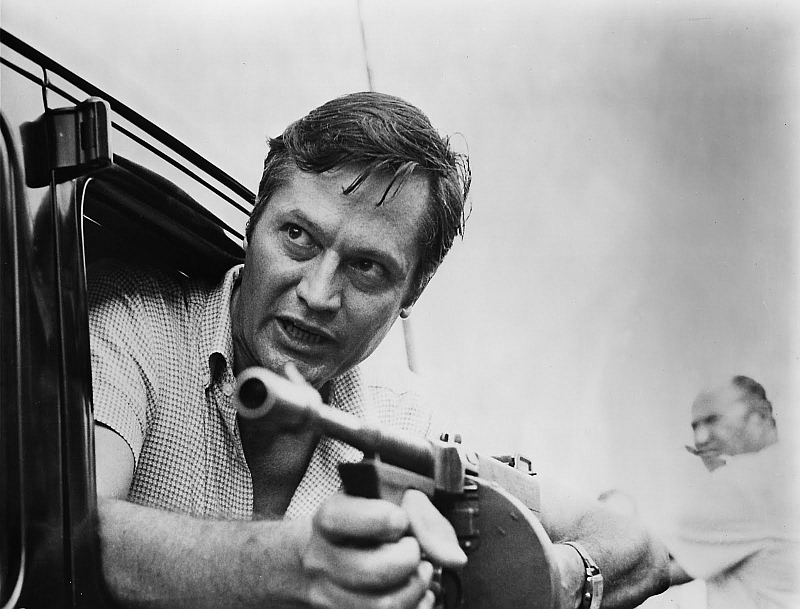 Read the first part of Alex Fitch’s interview with Roger Corman here. Alex Fitch: As a producer you’ve garnered a great reputation for finding young talent – directors like Peter Bogdanovich, Jack Hill, Francis Ford Coppola and Joe Dante. Where do you think that instinct came from? Roger Corman: It came from a specific reason. When I was making low-budget films, I could go for directors, cameramen, art directors, actors, and so forth, who would be all right for the task. Veterans of the industry had a certain level of expertise, but as a young man around Hollywood, I knew some of the brighter young people, and I thought it was better to gamble on somebody I knew and thought had potential, on the basis that even if he or she had less experience – or sometimes no experience – there was a talent there which would get me a better moving picture. But it does almost seem like you had a bit of a preternatural instinct at finding good talent you could nurture. Were there dozens of people you turned down for every director that you did choose for a project? You’ve worked in various genres – science fiction, horror, Westerns. Do you think that in each decade you’ve worked in the business, different genres have reflected different themes of the times? To a certain extent. I think they reflected my concerns as I’ve moved through time and through my life, and also what was happening at each particular time. For instance, in the 1960s, I moved from the classical Gothic horror films of the Edgar Allan Poe series to things like The Wild Angels (1966) and other Hell’s Angels and biker movies, then on to The Trip (1967) and LSD-inspired movies. They were subjects I was interested in, but they were about what was happening in culture at that time. Working with people like Jack Nicholson and Dennis Hopper, you encouraged them not only to be actors, but also to work behind the camera. Did that go back to your days of having worked on set, and to the idea that to have a proper understanding of film, you need to try out more than one role? Yes, I like to have everyone working in multiple capacities wherever possible. Have they given you feedback on how that’s helped their careers? As the 1970s progressed, you became more of a producer than a director, and helped start the careers of the directors I mentioned. Did you feel like a proud parent as they went off to do other projects for other studios? It’s interesting that a lot of those directors have gone on to make movies that cost $100 million and more. I wonder if there’s advice that you might give to directors starting out in the industry, that, actually, if you start off with low budgets – because you know how to efficiently spend money at that level – it prepares you better for the mega-budget films later on? For more information on Roger Corman’s life and career, the documentary Corman’s World: Exploits of a Hollywood Rebel is released in the UK on Blu-ray + DVD by Anchor Bay Entertainment. By the end of the 1970s, you’d become – to use an uncomfortable word – a ‘brand’, with your name above the film title. Did you feel that as people got to know the kind of work you were making, you were under more pressure to deliver films that were beyond their expectations? I’ve always felt that. I’ve always felt that I should give the audience more than they expect when they come to see a film. Generally that’s happened. Occasionally, it’s not happened. One aspect of your career that perhaps you’re not that well known for is that you also became a distributor of foreign language films in America, presenting films that perhaps local audiences would have never seen if you hadn’t shown an interest in them. Did you get much in the way of thanks from the industry for doing that? I don’t know if I got thanks, but I got recognition. What I felt was that I’d built my company New World Pictures into what was really the strongest independent distribution company in the 1970s, and I simply wanted to distribute the films of these auteurs. They were being distributed in two ways: very often by small companies that were little more than aficionados, and didn’t really have distribution strength to book the films the way they should be; or they were distributed by major studios who were great distributors, but for a certain type of film, they didn’t quite understand how these films should be distributed. I felt we were in between. We were small enough to give these films individual attention, but strong enough to book them into the right theatres in the right terms, and I simply wanted to distribute these filmmakers’ work. I wasn’t a charity, I wasn’t going to have nothing out of them, but I wasn’t expecting a big profit. I tried to break even or make a couple of dollars, so we ended up with Fellini, Bergman, Truffaut, Kurosawa, and the list goes on! I guess to a certain extent, as you were saying, that meant presenting their films in a certain way because the American audience of the time didn’t know what to expect from international filmmaking. Well, our general pattern was this: we would open the film in New York and Los Angeles, and get reviews from critics in those two cities. Based on the grosses from there, we would book the films around the country. We had a very interesting way of doing that: we went to a lot of college towns and if we opened, say, Bergman’s Cries and Whispers (1972) in somewhere like Detroit, we would then open in Ann Arbor, the home of the University of Michigan, because we found that way we made very big grosses. It became a little more complicated if we opened a film in San Francisco, we’d simultaneously open in Berkeley – home of the University of California – and Palo Alto, where you find Stanford. Your final film as director was Frankenstein Unbound (1990) and I think it’s a really underrated gem. It’s a film that partially adapts Mary Shelley’s original novel and adds time travel to it. Suitably, one of the themes of the original book is the juxtaposition of old technology and new technology, and Frankenstein Unbound takes that to a different science-fictional level. Was that something you were considering when you made the film? Those themes were definitely in my mind. What had happened was that Universal Pictures had done some market research and came up with the decision, result or whatever, that the idea of ‘Roger Corman’s Frankenstein’ would be successful, and they asked me if I wanted to make it! I said: ‘No, it’s going to be just another Frankenstein film, and there have been 50 or more of them. It’ll just be the 52nd…’ but they kept coming back to me every six months and kept offering me more and more money! Finally I thought: if I can just find a new way to do Frankenstein, then I’ll make it. Brian Aldiss – a very good British science fiction author – had written a novel called Frankenstein Unbound, in which a statesman from the 21st century travels back in time and meets Doctor Frankenstein. I thought it was a great idea, but I changed the lead character to a scientist, because I wanted to do exactly what you said, I wanted a scientist of the future with knowledge of all future technology, to go back 200 years or so and meet a scientist at the beginning of modern science. I thought the juxtaposition would be interesting. But you didn’t film Aldiss’s sequel novel Dracula Unbound. Was it too difficult a book to adapt or did you want go in a different direction? I just wasn’t quite that delighted with the film I’d made – some of the circumstances were beyond my control – I think I did a fairly decent job, but I felt the years piling up. It was easier, going back to being a producer. Were you never tempted to direct again as the years progressed? I’ve thought about it occasionally, but what would I do? There are two things I’d do: I would find a subject that was special to me that I definitely wanted to make, or I might just take the next script that comes off our assembly line and just shoot it as one of those types of films. Somehow I just didn’t get round to doing it. I’d assumed it was. I felt I’d learned just about as much as you could with 35mm film without becoming a cameraman; digital came in and I only understand a part of it because every 90 days a new camera comes out or there’s a new technique, and it turns out that it’s far more difficult than I thought it was to shoot with. We have a technician on the set at all times doing I have no idea what, but he’s sitting with the cameraman. Then he goes through various stages of the work before you can cut with this stuff. So, I’d assumed this was immediately going to be faster and cheaper… It’s a little faster to shoot, but you lose time and money in the transferring back and forth. You’ve also been encouraging directors to make what are called ‘micro-budget films’, an example of which was Alex Cox’s Searchers 2.0 (2007). Was that because new technology opened doors to even lower-budget movies than shooting on film, even with the problems you mentioned? Yes. The idea actually originated with Jon Davison, who started his career with me, first as the head of our advertising department, then as a producer. He went on to produce Robocop (1987) and some giant-sized science fiction films. He’s younger than I am, but semi-retired and he came up with the idea of doing the film and doing it with Alex. The idea seemed to me a very good and interesting one and it wasn’t going to cost that much money, so we did it simply as an experiment. I thought the picture turned out well, I thought Alex and Jon did a very good job. You have a cameo in the film as a sort of parody of yourself. Whose idea was that? It was Jon’s (laughs). You’re the first person to ask me about Searchers 2.0! The film did all right, but we expected more. It was such an unusual film, and it was such a hip idea. At the end we went up to Monument Valley, where John Ford shot many of his Westerns, and had the classic gun fight between the two guys, which I thought was great fun. Frankenstein Unbound and Searchers 2.0 are available to import to the UK on Region 1 DVD. I suppose that’s almost an inevitability when you’re working with a director like Alex Cox, who often has references to other movies in his films. It must have been so tempting for him. We’ve spoken about how you nurtured young talent on the set, and a few years ago, you brought out your autobiography, How I Made a Hundred Movies in Hollywood and Never Lost a Dime. I was wondering if any young filmmakers come up to you and say that the book inspired them to work in the industry? A surprising number have, and they’re not all Americans! I go fairly often to foreign film festivals and people come up to me out of the blue. A director in Odessa, at the Ukrainian film festival last year, said he’d read the book. Do they say what skills it’s helped give them? They’re never specific, just in general that it’s helped! Another example of your use of new technology was Joe Dante’s mini-series Splatter (2009), which you produced. Having watched an episode, the audience could vote on how the story should progress, so for a three-part series, you had to shoot about twelve different variants. Was making cinema interactive something you’d been thinking of previously? It was actually my wife who came up with the solution. She said: ‘What we could really do is shoot the death of everybody in advance and then shoot connecting scenes’, so we’re still doing what the audience says. If they want character A killed in the second episode, we’ll give them that, but everything, including the multiple lines that lead to it, are already shot, and all we have to do is cut it all together to create the death of whoever everyone votes for. That was what enabled us to do the thing on a reasonable budget. Do you think working at that speed helps to keep the filmmaking process fresh, because you’re not planning shots endlessly, and you’re working on instinct to a certain extent?